Gone in Sixty Seconds or Instant Karma? – Accurate (Peel) Appraisals Inc.
Gone in Sixty Seconds or Instant Karma? 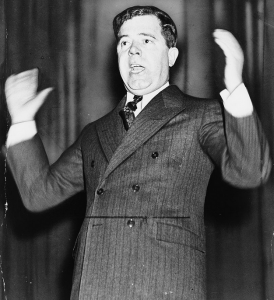 Just Imagine meeting the quintessential, fast talking cousin of Huey P. Long, when applying for your next instant home loan? AKA – “The Kingfish” & 40th governor of Louisiana? If you feel a pang of doubt when this charismatic relative shares his belief, “that every man a king”, you may not be 1/2 wrong! Instant mortgages are coming soon – what could go wrong? Angelo Mozilo was America’s mortgage king. A butcher’s son from the Bronx, he started in the real estate business at age 14, working as a messenger for a Manhattan lender. After completing university, he founded Countrywide Financial in 1969. The California-based firm eventually became the largest mortgage lender in the United States – a feat fuelled by Mozilo’s decision to automate its loan underwriting system in the 1990s. Early adoption of technology allowed Countrywide to outpace its rivals. Catering to both prime and subprime borrowers, Mozilo boasted that Countrywide was actually “a technology company” in the financial services industry. But Countrywide’s tech advantage didn’t prevent a huge number of its loans from souring as the U.S. subprime mortgage crisis took hold in 2006. Nor did it avert the firm’s collapse. Bank of America bought the troubled lender in 2008 and later paid a hefty fine for bad loans approved by Countrywide’s automated system. A decade later, automation is back in vogue, and bank executives boast that they’re in the technology business. Artificial intelligence is another holy grail, as banks try to cut costs and fend off fintech rivals that offer quicker access to credit. Mobile apps and cutting-edge technology certainly increase the cool quotient for banks. But they also present an ominous frontier of risk at a time of rising interest rates, high household debt and increasing mortgage fraud. It’s easy to understand that banks want to cut costs. Time is money for their customers too, especially millennials who prefer to bank on their smartphones. At present, traditional borrowers often wait 20 days or more for their money, even if they’ve been preapproved for a loan, according to the consulting firm Oliver Wyman. Next-generation banking products are expected to offer real-time credit decisions and faster access to cash. That sounds appealing, but the devil is in the details. Online credit applications are inherently risky because banks have a harder time verifying an applicant’s identity. Hacks of companies such as Equifax Canada, which handle confidential customer data, should also give us pause. To get up and running quickly, many banks partner with outside technology firms to enable real-time credit assessments and other online services. The trouble is those firms are not subject to the same regulatory oversight as banks. In 2016, National Bank of Canada’s Credigy subsidiary agreed to buy $1.3 billion of consumer loans through a platform managed by California-based fintech LendingClub Corp. National stressed it was using its own criteria to select the loans. Banks say that artificial intelligence will give them better analytics, but risk models are only as good as their underlying assumptions and data. If you think that Canadians are too honest to lie on loan applications, think again. In recent years, faulty mortgage documents, including client misrepresentations, have surfaced at Home Capital and Laurentian Bank. Mortgage fraud is on the rise. Equifax Canada says it has data that shows a 52% increase in suspected fraudulent applications from 2013 to 2017. Stricter mortgage rules introduced by Ottawa earlier this year will likely give consumers even more reason to fib on their applications. High housing prices and household debt levels “increase incentives to fraudulent activity, such as overstating the borrower’s income,” S&P Global Ratings said in a recent report. The answer isn’t just improved consumer literacy and stricter penalties for mortgage fraud, but increased oversight of new fintech players that offer banking services and of regulatory tech companies that support banks’ digital offerings. With both the Bank Act and federal anti-moneylaundering laws currently under review, this should be a no-brainer for Ottawa. As the rise and fall of Angelo Mozilo demonstrates, flashy computers don’t always make the best lending decisions. Bethell Hospice Volunteer Appreciation Gala!